Because of its basal cleavage, topaz requires special care during cutting, polishing, and mounting. It’s not very tough, so a hard blow might split it, and extreme pressure or sharp temperature changes might cause it to break. To reduce the risk of breakage, cutters orient faceted topaz so the cleavage direction is at about a 15-degree angle to the table. 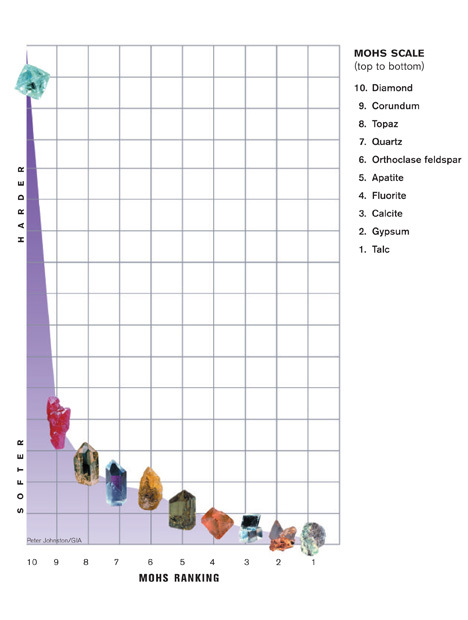 Jewelers prefer to set valuable topaz gems in protective mountings. Or they use topaz in pieces that aren’t exposed to too much wear, like pendants and pins. High heat or sudden temperature changes can cause breaks in topaz. The gem’s color is generally stable to light, but prolonged exposure to heat or sunlight might cause fading in yellow-to-brown, reddish brown, or dark brown topaz. Topaz is affected only very slightly by chemicals. It’s important to avoid steam or ultrasound for cleaning topaz: Warm, soapy water works best. Besides irradiation and heat treatment, there is another treatment that involves coating colorless topaz with a microscopic layer of metallic oxide compound. The coating is not very durable. It can resist daily wear and tear, but abrasive cleaners or buffing wheels would remove it. It’s safe to use a mild soap solution. 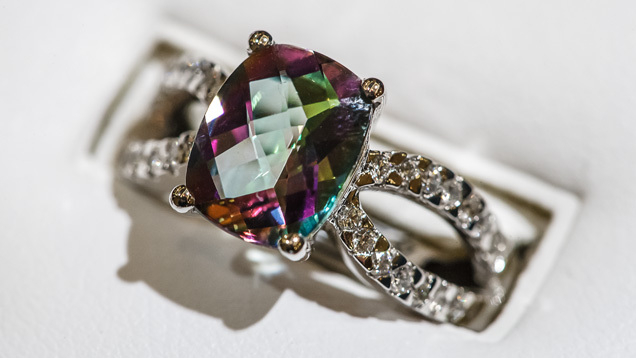 Despite these care considerations, fine topaz is a beautiful gem that offers a range of warm, attractive colors in large sizes that are often free of visible inclusions or flaws.